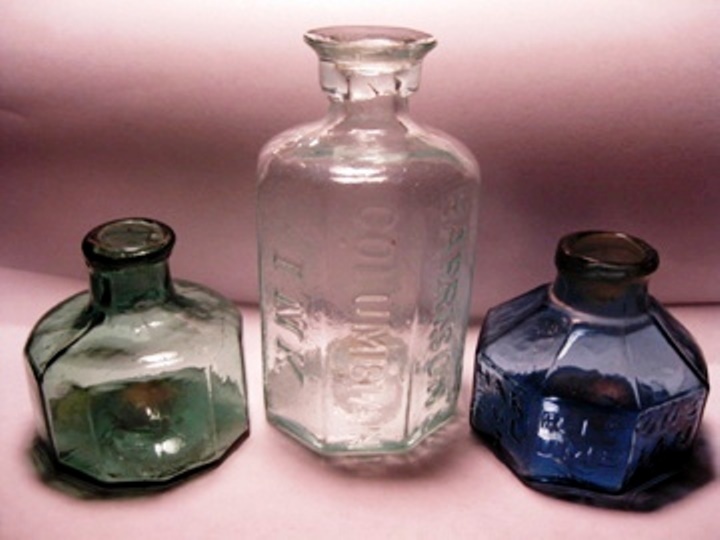 Many advanced collectors of early American glass bottles will tell you the category they first started collecting was ink bottles. Their diminutive size and alluring colors and shapes catch the eye of anyone with an appreciation for detail and a fascination with the early glass-blowing trade as it developed on this continent. For a beginner collector, or an interior decorator in search of vintage accents for old cupboards and desks, a 120-year-old ink bottle will often fit the bill and is very affordable. For a few dollars, you have an authentic glass container that was used every day by someone with a quill pen, sitting at a desk, filling out bills or invoices, or carefully writing a letter by hand in cursive (which is becoming a lost art). I have been a bottle “digger” in New England for 30-plus years, digging in the forest, in foundations, in old outhouse pits and even under water with the help of SCUBA equipment. If I didn’t have other responsibilities, this is probably all I would do; it is simply that much fun. Compulsive bottle hunting doesn’t lend well to raising a family and paying bills, however, as the following story attests. One chilly spring day several years ago, that compulsion to find new old bottles was filling my mind as I drove down the main street of our town. In the back seats of my minivan were my two toddler daughters. Right on the main drag, I noticed some renovations being done on a large colonial house. But what really caught my eye, was a pile of dirty black bricks that had been dug out of the basement and dumped, along with some other construction trash, next to the side walk for disposal. This simply needed to be investigated. I parked up the road a bit, put my daughters into the double stroller and, rolling and banging the stroller across the potholed sidewalk and over some curbing, headed towards my target. When I got to the brick pile, and could see the bricks were ancient and covered with decades of chimney soot. My eye caught a black, disk-shape object in amongst the rubble and I knew instantly what it was. I left them briefly in the stroller on the sidewalk and mucked through the mud a few steps to gather the shard. But it wasn’t a shard; it had somehow survived intact while being dumped along with the bricks! The bricks were so sooty, and there was so much ash and dirt that must have cushioned the fall—to this day still I don’t know how it survived—but there it was, flawless, without a chip on it. I grabbed it and ran back to the stroller, yelling to the girls about what I had found. I showed it to them both while hooting and hollering and shaking the bouncy stroller in celebration. My older daughter laughed at the strange way I was acting, my younger daughter, who had been sleeping, cried in horror at the crazy man who woke her up (they are now accustomed to this behavior). Upon further inspection, I held a geometric ink bottle. It was a round, disk-shaped bottle with embossed patterns in squares, diamonds and triangles over its entire surface, except for the base, which has a round, usually sharp pontil scar at its center. 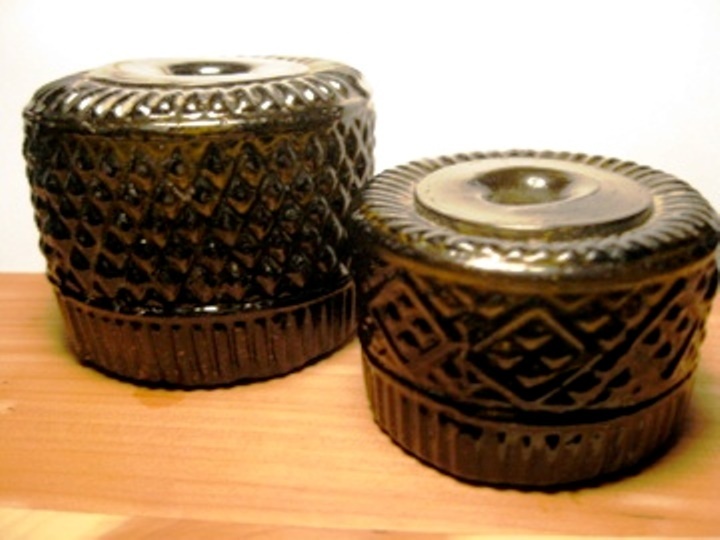 These bottles were blown into a three-part mold, and had a uniquely wide, flared lip, which was lifted up as it was blown, and then pressed back down onto the top of the bottle, basically eliminating the neck of the bottle, producing an almost hockey-puck shaped bottle, with a hole in the top for dipping the quill. Any geometric ink bottle is a great find, with a value spectrum varying, depending on mostly on two things—mold rarity and color. The two I have pictured here (center photo) are from one of the most common mold patterns and in the most common colors, olive amber. There are several dozen different mold variants of New England geometric ink bottles, with the rarest obviously being the most valuable. 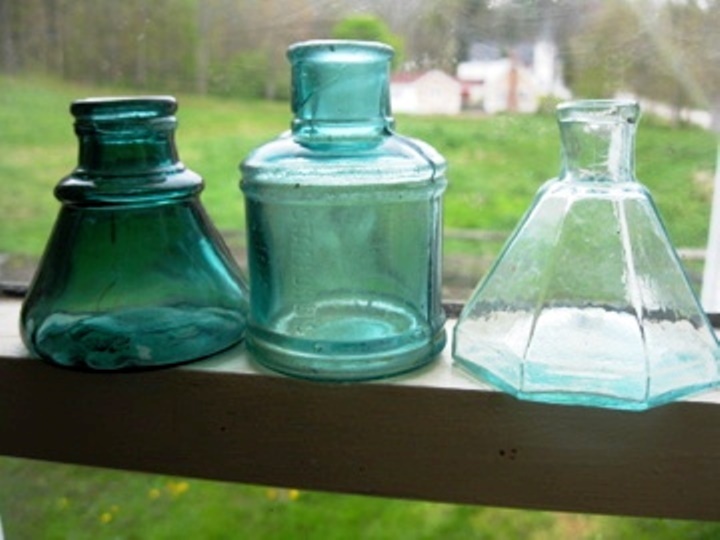 The effect of the colors of these bottles on their value is less obvious, ascending in value from dense olive amber, to medium olive amber, to pure olive green, to light olive or light amber, to the rare clear flint glass, to the most rare and gorgeous sapphire blue or cobalt blue (made at Sandwich Glass Works), which can be worth more than $10,000, depending on the mold variant. I was more than happy to find the “common” geometric ink bottle, considering the circumstances. Part of the appeal of antique ink bottles is that with their small and consistent size, a collector can display 100 beautiful colored bottles in a shelved bay window, creating a colorful spectacle that you can just sit back and watch as the sun sets behind it. The idea that such beautiful pieces of glass were discarded when they were empty is hard to believe when you hold one in your hand. One man’s trash is another man’s treasure is an old cliché, but couldn’t be more precise in this case. Each of the bottles pictured in this article was dug in New England, and while bottle-digging sites are harder to find today, there are still many more to be found.